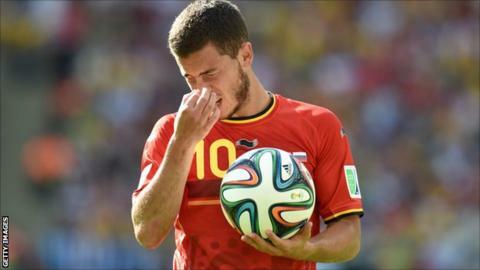 Belgium coach Marc Wilmots says he is still waiting to see the best of Chelsea midfielder Eden Hazard at the 2014 Fifa World Cup in Brazil. Hazard, 23, has set up two winning goals in his side's three wins but has shown only glimpses of his quality. "I think for the moment Eden wants to do more," said Wilmots. "He can do a lot for us, everyone knows that. "Now I'm waiting to see it. It's not a question of putting pressure on him as I know he's under a lot of pressure." Wilmots added: "I'm waiting for him to take hold of a match and impose himself, even if he's still young to be doing that." Hazard, who was voted the Professional Footballers' Association Young Player of the Year for the 2013-14 season, says there is more to come from him. "In this World Cup, I have yet to play a great match, even if I had good moves which were decisive," said the Chelsea player. Hazard will get another chance to impress in Tuesday's last-16 game against Jurgen Klinsmann's United States side. "If they want to go through, they will have to move up-field because we defend well," said Hazard. "And I hope it will open space so I can show a very good Eden." He started on the bench in Belgium's last group game, the 1-0 win over South Korea, but showed his quality when he came on in the final minutes and nearly scored. "He can find gaps and score goals. We've discussed it together - he wants to be more decisive, but there's a difference between saying it and doing it," said Wilmots. "I'm confident in him and I think all of Belgium is confident in him but it'll take a collective effort from all of us for this to happen."